1960s: The discovery of the Endako orebody and its development by Placer Development Ltd. as a large open-pit molybdenum mine attracted several major mining companies into the region including Anaconda American Brass Limited (1966), Amax Exploration Incorporated (1967) and Cyprus Exploration Corporation, Ltd (1970). 1966: Anaconda American Brass Limited, acquired mineral claims (Owl Group) on the south side of the Nithi River valley as a follow up on regional silt and water geochemical survey anomalies in molybdenum and copper. A soil geochemical survey was conducted whereby 262 mainly B soil horizon samples were collected over a large 600 feet by 400 feet grid. Sporadic highs in copper, molybdenum, lead and zinc were found but with heavy metal concentrations principally associated with swamps (see, BC Assessment Report No. 01002). 1968: Anaconda American Brass Limited (Owl Group), conducted deep soil sampling (three feet deep, sampled every one vertical foot) on 200 feet spacing to determine copper, molybdenum, lead and zinc contents (see, BC Assessment Report No. 01216). 1969: Mercury Explorations Limited (N.P.L. ), acquired a large block of mineral claims (Count Group) between Nithi Mountain and the claim holdings of Anaconda and Amax. Twenty-four miles of induced polarization survey locate a 7,000 feet by 1,000 feet anomalous zone that trends in an east-northeasterly direction. Drilling is recommended in five holes (see, BC Assessment Report No. 02368). 1970: Cyprus Exploration Corporation, Ltd. acquired a very large group of mineral claims to the northeast of XAMA. The scope and results of their work is not well known as there was little to no public disclosure. 1974: The NDP government enacted Bill #31, an extremely punitive mineral Super Royalty. This action resulted in most of the major mining companies leaving BC, including those in the Nithi and XAMA exploration areas. Exploration drill holes that had been recommended were never drilled. 1990 to present: Local prospectors Garry D. Bysouth and Gary W. Kurz acquired the Skip Group of claims over areas originally explored by Anaconda and Amax. Several small exploration programs, including: prospecting, self-potential surveys, soil geochemical surveys and percussion drilling short holes were conducted to 2012. See BC Assessment Report No’s: 21587, 22061, 24798, 28350, 29601, 32400 and 33221. 2014: KGE Management Ltd. (Gerald G. Carlson, President) and John A. Chapman acquired a large block of mineral claims surrounding the Skip Group owned by Bysouth and Kurz. The two properties have been combined as the XAMA property. 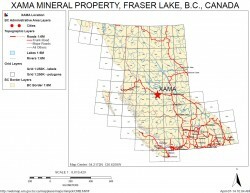 The XAMA mineral property is located in central British Columbia ~160km west of the City of Prince George, 12km south of the resource (timber and mining) Village of Fraser Lake and ~21km southeast of the Endako Molybdenum Mine (largest molybdenum mine in Canada, operating since 1965). It is possible to work all year round in the area, as the summers are warm and reasonably dry, and the winters are not too cold, nor the snowfall too heavy to prevent any operations. The Property consists of seven BCMTO mineral tenures covering 3,579ha. Registered owners are John A. Chapman, Gerald G. Carlson, Garry D. Bysouth and Gary W. Kurz. The Property is available for Option. The Property has excellent access via a network of all-weather logging roads that connect to Highway 16 near the community of Lejac, ~2km east of Fraser Lake village. The topographic relief in the area is gentle which is typical of the BC Interior Plateau. Logging has been, and continues to be, very active in and around the XAMA area as one of the world’s largest sawmills is located at Lejac (Fraser Lake Sawmills, a division of West Fraser Mills Ltd.). The XAMA property is underlain by granitic rocks of the Topley Intrusives that form a ~140 million year old batholithic complex, ranging from diorite to alaskite, some 300km long from Babine Lake to the City of Quesnel. This intrusive complex was emplaced between the Stikine and Cache Creek Terranes in an island arc-related magmatic event that continued into the Tertiary. It forms the Topley Porphyry Mineral Belt; host to a number of porphyry deposits and prospects. The discovery of the Endako orebody and its development by Placer Development Ltd. as a large open-pit molybdenum mine attracted several major mining companies into the region including Anaconda American Brass Limited (1966), Amax Exploration Incorporated (1967) and Cyprus Exploration Corporation, Ltd (1970). The XAMA Mineral Property is not available at this time.